Despite all the tasty fall recipes that can destroy your diet faster than you can say Pumpkin Pie, with the abundance of fall vegetable recipes, it’s not hard to find a lot of delicious low Points dishes you can incorporate into your plan without missing out on fall flavors. 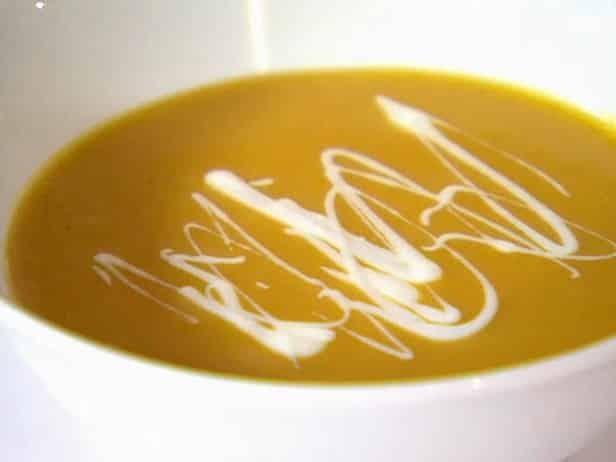 One of my favorite seasonal staples, is this tasty, low calorie Butternut Squash Soup Recipe. It’s creamy, tasty and full of fiber, but low on Weight Watchers Points. In fact, each super yummy serving has just a 3 Points. By incorporating a few of the basic ingredients from traditional brown butter sage sauce recipes, this Butternut Squash Soup is sure to please your palate without punishing your waistline. Spray a large, nonstick saucepan, with non fat cooking spray (the butter flavored kind). Then add in the garlic and onion. Sauté until translucent, about 5 minutes. Add the squash, broth, lemon juice, nutmeg, salt, pepper and sage; bring to a boil. Reduce the heat and simmer, adding the water 1?2 cup at a time, until the squash is very soft, about 20 minutes. Remove from the heat and let cool 30 minutes. Pour the mixture through a strainer; reserve the liquid. Transfer the squash mixture remaining in the strainer to a blender or food processor; add the yogurt. Puree until smooth. Add 1–1 1?2 cups of the strained liquid, a bit at a time, until the soup has a fluid but creamy consistency. Transfer the soup back to the saucepan and cook, stirring frequently, until just heated through. Serve with an optional garnish of fresh chopped sage and a light drizzle of plain Greek yogurt, for no increase in Points value.